At dusk, Discovery Green’s Brown Promenade comes to life. Each evening 4,500 frosted glass bulbs on long steps “bloom” with colored light. Visitors can wonder down the middle of “Field of Light” and watch as the colors quietly roll across the park. Take the family to Downtown’s favorite park to ice skate, play on the playground, run through the grass or enjoy one of the many free events they host each week. 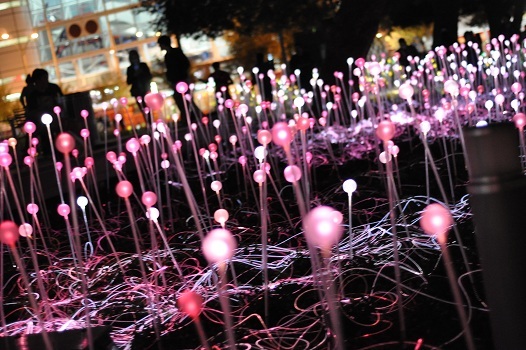 Once the sun sets, you will see the Field of Light near The Grove restaurant. In the evening, this strip of the park is packed with people enjoying the art. 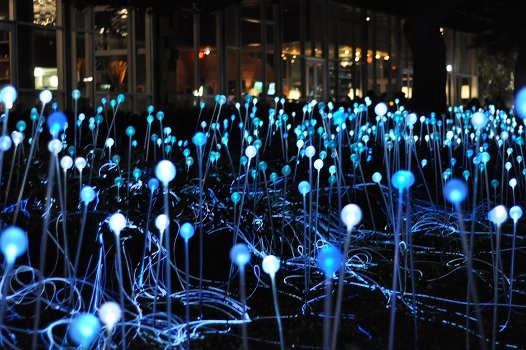 Visit Discovery Green’s Field of Light by February 21 to see for yourself!